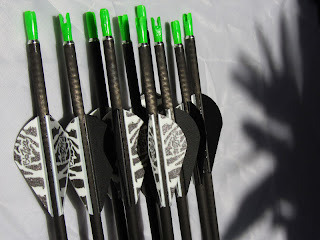 Today I’m taking you through the first of this year’s major archery purchases: new arrows. The arrow choice was made on advice – taking the jump from aluminium X7 to carbon is a significant step that can be costly. Considering the likelihood of upgrading limbs one can’t expect arrows to be well-matched to increased poundage, so it made sense not to spend a small fortune on arrows I may not use for that long. Luckily, Roger was on hand to recommend Carbon Express as an excellent alternative to Easton. I went with Medallion XR on the basis that the shafts and components came to under £140 for a dozen arrows, so not too big a deal if I need to upgrade them in six months. It’s the first time I’ve assembled arrows so there was a bit of a learning curve. Luckily, several experienced archers are a short hop away on email so advice was never far away. Let’s get on with assembly. First, I cleaned the shafts and inside each end with isopropyl alcohol. Then I fitted the nock inserts. I used Dragon Spit for these, seemed like a reasonable idea. 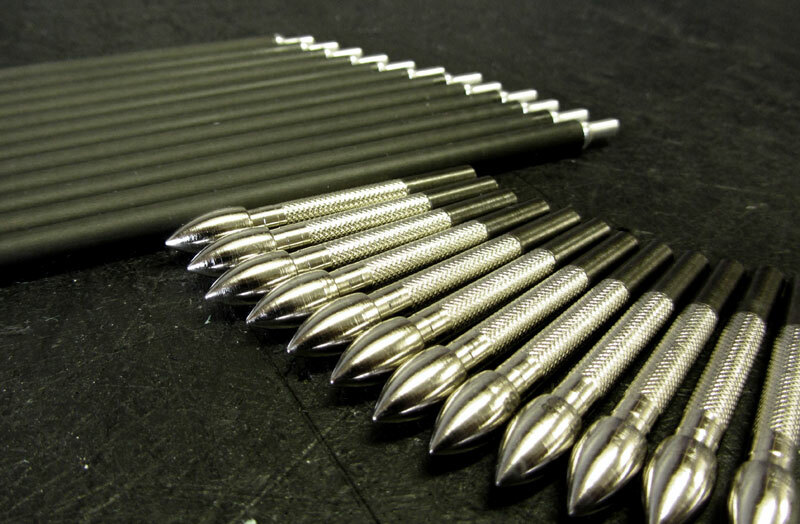 Before gluing, make sure all the shafts are the same way around or the writing will go different ways on your arrows! Next came the points. When it comes to points, there are many different fixatives recommended and it’s a little confusing. Would hot-melt be better than epoxy? Do you need to use an “archery” glue or will a bog-standard hardware glue work just as well? Can you get away with super glue or another cyanoacrylate instead? I couldn’t decide so I asked Roger – given his experience building and mending arrows it’s fairly safe to assume he knows what he’s talking about. He recommended hot-melt so I went with that. The points themselves were quite easy to fit, but I did find a couple of snags which can be avoided. Firstly, when working with hot-melt you have only the “hot” window in which to work with the glue before it goes off. As such, putting it on to a cold tip will decrease working time significantly. I heated the tips with a heat-gun until they were quite warm but still able to be held. With my first point, I inserted it too slowly and the tip got stuck halfway, so I heated the shaft gently for a couple of seconds until the glue had softened enough to push the rest of the point in, which worked perfectly. The trickiest part (for me) was fletching. I think I used too much glue on this first batch – getting the exact right amount eluded me. Too much is a bit messy and too little will not stick well enough. For reference, a blob of glue at each end of the vane will also help stop the vanes coming detached at the weakest part. It was the first time using my fletching jig so I had to set the alignment for the arrows I was fletching, but this was straightforward and didn’t take more than a minute or so. 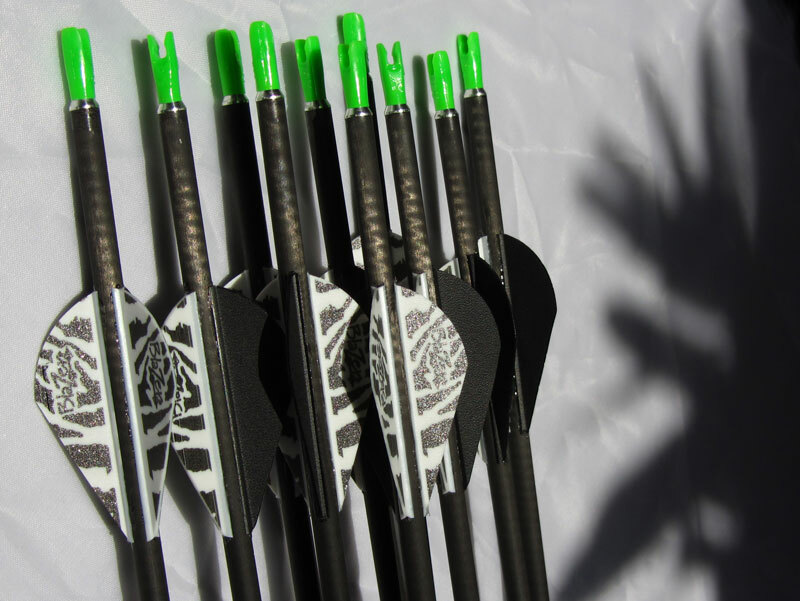 Fletching a dozen arrows takes time – every vane has to be glued, positioned and allowed to set for a couple of minutes before then removing the clamp and rotating to the next position. It’s very “on-off” work so good to do whilst doing something else (cooking, watching TV or even at your desk at work if you have a forgiving boss!). I’m sure there are some other tips which will help fletching/arrow building, would anybody like to add any? I build my own wooden arrows because it’s much cheaper than buying them. (think it worked out at about £2.50 per arrow). It’s quite a thrill to shoot your own arrows, and quite un-nerving the first time you pull them from the boss. My advice would be to be sure your points are well glued, and take some long-nose pliers with you when you test them in case the points don’t pull out with the shaft. It’s also good to number them somehow. That way if one is consistently out, you know which. I did this by changing the cresting (patterns painted on the shaft) for each arrow, so that each one is unique.